​Looking for a parkland setting for a retreat, meeting space, family gathering? Need a milieu with excellent acoustics to stage an intimate concert? Perhaps a church picnic followed by an evening service? Your special occasions will be enhanced by the natural wood floors and wooden arched ceilings of the church which provide an acoustic environment which receives great acclaim. The historic stained glass windows provide an unsurpassable beauty. The grounds surrounding the church are equipped with picnic tables, a firepit and and BBQs maintained by Toronto Parks. 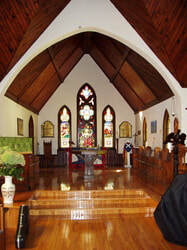 The Church of St. Andrew-by-the-Lake boasts some other great features that make these events possible. St. Andrew by-the-Lake is a beautiful setting for an Island wedding and is authorized by the Diocese of Toronto to perform same gender marriages. The church is an easy 10-minute walk from the Centre Island Dock, and a 25-minute walk from the Ward's Island Dock. In the warmer months, groups may elect to arrive at the church by water taxi or tour boat. The church dock is right behind the church. ​For more information Interested couples are invited to contact Reverend Canon Douglas Graydon at 416-363-6021 or 1-800-668-8932, ext. 236, dgraydon@toronto.anglican.ca. Check here ​for a directory of wedding services and reception locations on the Island.